The political party has suggested that three concerts should go ahead this year and the final two next year. File Photo- Pro Garth Brooks Concert Group. 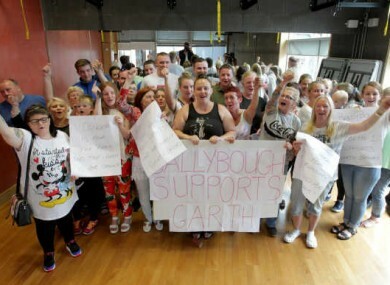 THE CROKE PARK residents who want all five Garth Brooks concerts to go ahead are holding a protest at the stadium today. They want Dublin City Council to reverse its decision to allow just three of the gigs to go ahead. Earlier today the Government ruled out enacting emergency legislation to resolve the crisis. It said the decision by Dublin City Council is a planning decision and as such is independent of Government. The Labour Party have said that, “The ball is now firmly in the court of the promoter, Aiken Promotions and the artist, Garth Brooks. The party has proposed that Brooks must agree to stage the three concerts this month and play the final two next year – at the end of a Garth Brooks World Tour. Such a compromise solution would produce five concerts, satisfy the majority of the fans, embrace the reputation of Garth Brooks and give a major economic boost to the economy of Ireland. The group who are protesting today say that the concerts will bring jobs and an economic boost to the area. Publicans in the area also want the five concerts to go ahead. The LVA estimates that the loss of the five concerts could cost Dublin pubs as much as €15 million. The Dublin economy can’t afford to see the concerts cancelled. The Chief Executive of the Labour Relations Commission, Kieran Mulvey, said that Ireland’s international reputation is becoming damaged due to this situation. Mulvey acted as a mediator between residents and Croke Park officials to try to resolve the row over the number of concerts being held. He said Dublin City Council’s decision cannot be amended or appealed however he added that he hoped a solution will be found within the next 24 hours. Labour added that its solution would also give Mulvey time to mediate a permanent agreement between the local residents and Croke Park. Email “Publicans and residents call for five concerts to go ahead - but Labour say they have a solution”. Feedback on “Publicans and residents call for five concerts to go ahead - but Labour say they have a solution”.